• For quantitative determination of reduced and oxidized glutathione (GSH/GSSG). • Glutathione , a tripeptide of glycine, glutamic acid and cysteine, is one of the key antioxidants involved in protecting cells from damages by reactive oxygen species. Glutathione (GSH) reduces disulfide bonds in cytoplasmic proteins to cysteines, in which it is converted to its oxidized form GSSG. BioAssay Systems GSH/GSSG Assay Kit is designed to accurately measure total, reduced and oxidized glutathione in biological samples using an enzymatic method that utilizes Ellman’s Reagent (DTNB) and glutathione reductase (GR). DTNB reacts with reduced glutathione to form a yellow product. 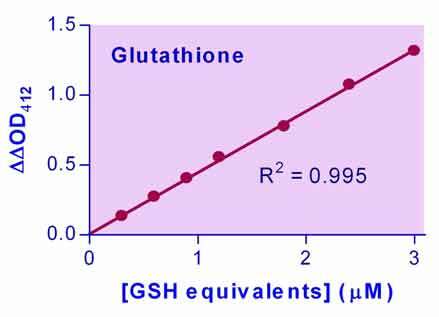 The rate of change in the optical density, measured at 412 nm, is directly proportional to glutathione concentration in the sample. This kit can also be used to measure oxidized (GSSG) by using a specific protocol which first scavenges all GSH with 1-methyl-2-vinylpyridinium triflate.